Magic Mirrors Slots Online - Play Here for Free Today! Magic Mirrors Slots Online is one of the games that are developed and designed by Merkur Gaming, which is a rising name in the industry that develops all kinds of cutting edge casino gaming products. 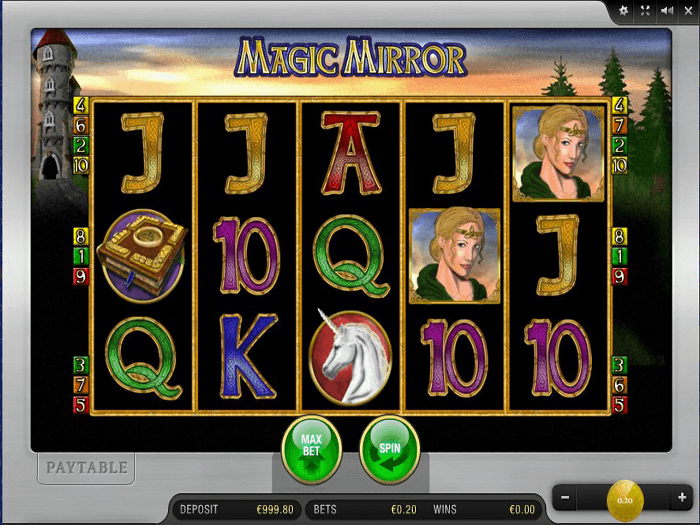 Magic Mirrors offers players a magical gaming experience that they will certainly enjoy. This magical experience will take them back to the Medieval times, the glorious days of kings and knights and dark magic. Players will travel back to this time era so they can enjoy the company of beautiful princesses, witches, kings and knights in a world filled with magic and fortunes. This is why players will get to enjoy the magic while they claim their own share of the golden treasures and fortunes of the medieval era. Magic Mirrors is a five-reeled video slot that hosts a total of 25 paylines. These reels and lines are located on the vast green field that is located in front of a big Medieval castle, which is very fitting to the theme of the game. The same can be said about the symbols of the video slot machine as they include a unicorn, a spell book, a witch, a magical bonus mirror, the scatter magical mirror, a ring and card icons. All of the different line prizes that the game has to offer are listed at the paytable of the game, which can be opened by players who click on the Paytable button that is found under the reels at the left side. The symbol that gives players the highest win possible is the blonde haired witch. She will use her magic in order to help players earn the biggest pay when 5 of her symbols land on the same payline. Since the game is entitled Magic Mirrors, players will find that the game has 2 special mirrors that are magical and can help them get paid generously. The first special symbol is the scatter magical mirror. This symbol is also the wild icon of the slot. All of this means that this symbol can replace other icons on the game’s reels and it would also give players scattered payouts when at least 3 of them land on the reels. The other special icon that the game has is also a magical mirror, but it has the word bonus on it. When players manage to get 3 of these magical bonus icons anywhere on the reels, they are going to claim 10 free spins on the video slot machine. The game also has a gamble risk game that players can play whenever they manage to create a winning combo. They will guess the color of the card and if they are right, they will be able to double their wins and if they are wrong, they are going to lose it. They can play this risk game multiple times. Magic Mirrors is a five-reeled video slot that hosts a total of 25 paylines. The game also has a gamble risk game that players can play whenever they manage to create a winning combo. They will guess the color of the card and if they are right, they will be able to double their wins and if they are wrong, they are going to lose it. Manage your risks correctly and you will walk away with a decent payday!